1. 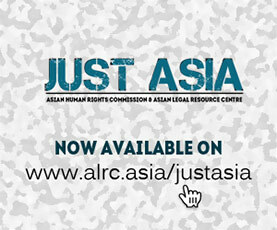 The Asian Legal Resource Centre (ALRC) wishes to draw the attention of the UN Human Rights Council to Indonesia’s dismal protection and acknowledgment of the right to freedom of assembly and association. As a state party to the International Covenant on Civil and Political Rights (ICCPR), the government has an obligation to guarantee such rights. The Constitution of the Republic of Indonesia (UUD 1945) also clearly guarantees and protects such rights. Despite this, countless violations of these rights occur, while the State is largely ignorant and indifferent. 2. Violations against the right to peaceful assembly and association committed by the government include forced dispersal of citizens attending public events, such as movie screenings and discussions. At such times, the police usually argue that no written permit was obtained, and that the event could trigger violence or is supporting Communist ideology. Rather than taking steps to guarantee freedom of assembly, the government has instead enacted controversial regulations against the ICCPR, such as the Internal Police Regulations on Hate Speech. The Police Regulations are not only incompatible with international human rights instruments, but also do not have clearly defined boundaries. They can be used against anyone who delivers statements in public, media as well as social media, particularly activists who frequently criticize the government. • On 26 February 2016, an anti-communist vigilante group accompanied by local police officers surrounded and forcibly dispersed the Turn Left festival, a peaceful cultural festival organized by human rights activists in Ismail Marzuki Park, Jakarta. • On 23 March 2016, an anti communist vigilante group forcibly dispersed and intimidated the local organizers of a monologue on Tan Malaka, a peaceful event in Bandung City, West Java Province. • On 1 April 2016, an intolerant mob forcibly dispersed and attacked a religious group gathering at the Islamic Women Center in Pasuruan Regency, East Java Province. • On 2 April 2016, local police officers accompanied by a local vigilante group forcibly dispersed a feminist festival, and the police officers fired into the air to intimidate the organizers in Bantul Regency, Yogyakarta Province. • On April 3, the vigilante Islamic Defender Front (FPI) forcibly dispersed and intimidated a peaceful public event organized by the Association of Islamic Students (HMI) in Pekan Baru City, Riau Province. • On 14 April 2016, Islamic Defender Front (FPI) along with police and civil service police unit (Satpol PP) conducted a forced dispersal of a national symposium organized by the Murder Victims Research Foundation (YPKP) in Bogor, West Java Province. The aim of the symposium was to find a solution to 1965 human rights abuses. The police intimidated the mostly elderly participants, and accused the symposium of attempting to establish a Communist party. • On 3 May 2016, the police, along with vigilante groups, forcibly dispersed the commemoration of World Press Freedom Day, organized by the Independent Journalist Alliance (AJI) Yogyakarta Province. The Yogyakarta City Police Resort (Polresta Yogyakarta) argued that the movie screening on “Pulau Buru Tanah Air Beta (Buru Island is my country)” was Communist propaganda (AHRC-UAC-043-2016). Although the Independent Journalist Alliance (AJI) reasoned that the movie is a journalistic endeavor and the commemoration of an annual event, the police ignored them. 4. Apart from movie screenings and public discussions, the ALRC’s sister organization, the Asian Human Rights Commission (AHRC), has also documented police attacks on peaceful demonstrations. On 30 October 2015 for instance, the police brutally attacked and forcibly dispersed a peaceful demonstration organized by labourers in front of the Presidential Palace (AHRC-UAC-009-2016). The police kicked, beat, and arrested 23 labourers, one university student, and two public lawyers of the Jakarta Legal Aid (LBH Jakarta). Before their arrest, the student and lawyers were monitoring the protest and supporting the labourers who were demanding the cancellation of Government Regulation (PP) No. 78 of 2015 on wages. After their arrest, the 26 activists were charged with Article 216, paragraph 1, and Article 218 of the Penal Code (KUHP) on crimes against public authority. Since April 2016, their trial is ongoing at the Central Jakarta district court. • Urge the Indonesian government to stop all violations against the right to freedom of peaceful assembly and association. • Urge the government to review and amend its national laws and regulations that are contrary to the international human rights instruments that Indonesia is party to. • Urge the government to ensure that all branches of the government understand and are able to implement human rights in their daily work, by providing clear guidelines and periodic training without discrimination and without undue delay. • Convince the government to officially invite the UN Special Rapporteur on the right to freedom of peaceful assembly and association to visit Indonesia.